The International Programme for the Development of Communication (IPDC) of UNESCO supported a project ‘Innovations for Safe Environment in Conditions of Restricted Freedom of Expression’ of the Guild of Court Reporters Public Association. The project provides development and launch and conducts practical training to use of a mobile application ‘Soz Sende' (You Talk) that promotes safety of reporters. The mobile application development started at YouthMobile Summer school in 2016 in Almaty. The app is a system for alerting an emergency situation to which a journalist might be exposed. Information about an emergency situation or attack is to be displayed on an interactive map to other users of editoirial group. Also, the mobile app contains a training modules on journalists rights and instructions how to act when detained. 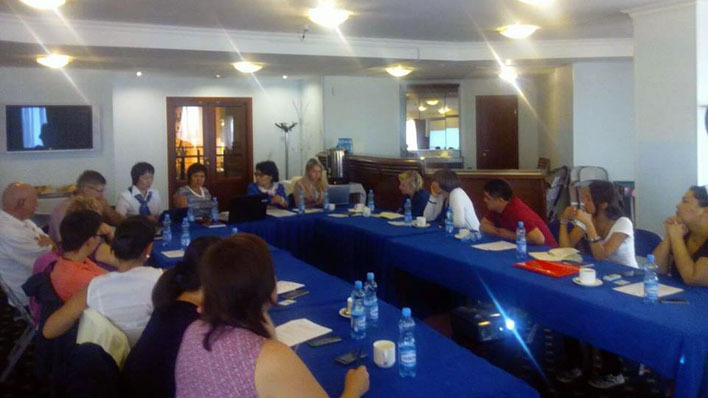 The mobile app ‘Soz Sende' for journalists is presented to court reporters from Kazakhstan on 19 September 2017 during training workshop in Almaty. This also will be the start of an information campaign of the mobile app. 28-29 September two online consultations take place on the right to freedom of expression and protection of journalists with the mobile app "SozSende". Promotional video on app developed by Guild of Court Reporters. The app interface is translated into Kazakh language. Training and consultations are devoted to the International Day for End Impunity for Crimes Against Journalists - 2 November. Some of the consultations will directly use the data from the Director General report, to highlite and prevent the problem of impunity. The project is designed to strengthen free, independent and pluralistic media and contributes to Sustainable Development Goal (SDG) 16.10. App Soz Sende accessible for downloads on Google Play. The International Programme for the Development of Communication (IPDC) is the only multilateral forum in the UN system designed to mobilize the international community to discuss and promote media development in developing countries. The Programme not only provides support for media projects but also seeks an accord to secure a healthy environment for the growth of free and pluralistic media in developing countries.